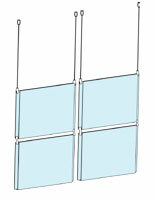 Ceiling hanging cable system included for each column of frames, ideal for window advertising. Metal cable system components have a satin silver finish to add elegance to any environment. 11"w x 8-1/2"h Posters top-load into acrylic frame for easy and quick switching of graphics. 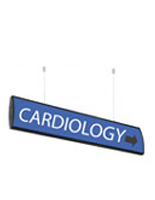 This ceiling hanging signage, also known as cable suspending signage, is versatile and looks great in many environments. 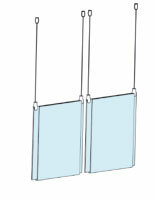 The crystal clear acrylic panels included in this system are eye catching yet take up little space. 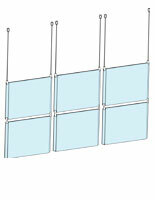 The suspending hardware included with this ceiling hanging signage allows users to install in a storefront display, above a counter, or on virtually any ceiling. 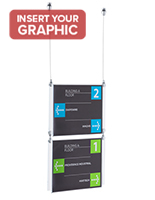 This display can be utilized in retailers, restaurants, hotels, art galleries, real estate offices, and more! This ceiling hanging signage looks great in storefront displays to attract passerby customers. 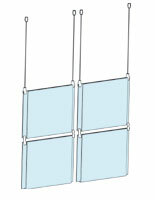 Purchasers can maximize use by placing graphics back to back for a double sided display. This cable display, ceiling hanging signage comes with custom designed satin silver hardware that adds elegance to business advertising. The nylon coated stainless steel wire does not fray when cutting to size and comes with an ample length for even the tallest ceilings. This ceiling hanging signage is stylish and sleek to fit into any business! The panel grippers securely hold signage in place. 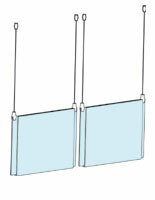 This ceiling hanging signage allows users to switch out graphics quickly and simply with the top-insert acrylic panels. This display is a contemporary solution to visual merchandising. This ceiling hanging signage is convenient for businesses who want to replace bulky, outdated advertising signage.